Listening and Longing: Music Lovers in the Age of Barnum. Daniel Cavicchi. Middletown, CT: Wesleyan University Press, 2011. 280 pp. $24.95 (paper). Is listening the constitutive act of modernity? It seems so. Thanks to a flood of scholarship on aural culture in the late nineteenth and early twentieth century—Emily Thompson's The Soundscape of Modernity (2002), Jonathan Sterne's The Audible Past (2003), and a 2011 special issue of American Quarterly (edited by Kara Keeling and Josh Kun) being just three examples—the act of listening has worked its way into the texture of cultural studies generally and modernist studies specifically. The field broadly called “sound studies” might be better referred to as “listening studies,” as an umbrella term for a range of new technologies, cultural behaviors, and professionalized practices. Listening to one's social world is an active intervention, an “audile technique” (as Sterne calls it) that engages dialectically and fluidly with modernity's new economic structures and affects. It is perhaps not unforgivable, given my Anglocentric scholarly focus, that nineteenth-century America has been at the outer limits of my broadcast range for much of that time. 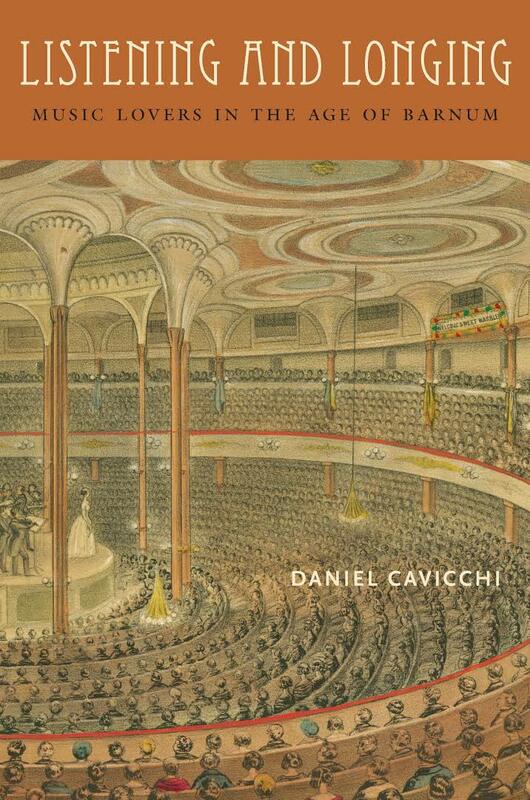 But a recent rediscovery of Daniel Cavicchi's excellent study Listening and Longing: Music Lovers in the Age of Barnum has convinced me that this is a gap in need of correction. As Cavicchi points out, the soundscape of antebellum America, and the act of listening itself, were undergoing lively and important changes in the nineteenth century. Many of these changes prove homologous to the literary and historical problems that make modern(ist) listening so complex: mass-reproduction, commercialization, aesthetic autonomy, technological mediation, and so on. Cavicchi, an American Studies ethnomusicologist, proposes an “emic” approach to the cultural study of sound, rooted inductively in on-the-ground experiences as they generate meaning (much as Jennings does, in his version of what Jed Esty calls the British modernist's “anthropological turn”). What Cavicchi calls “audiencing”­—the ongoing negotiation of which public fora count as audiences, how audiences behave, what commercial behaviors are involved in pulling an audience together—turns out to be immensely complex. And though he does not traffic in terms such as “surface reading,” Cavicchi's emic approach keeps Listening and Longing attentive to the contoured networks of musicians, performers, auctioneers, exhibitors, and listeners. Still, the study is rich with broader social and symbolic implications. It is well established that the cultural phenomena of antebellum America, such as sentimentalism, were inextricable from local and global marketplaces. So, for example, the white female middle class to which antebellum social missions often aimed their sentimental appeals had their antennae tuned simultaneously to the borders and frontiers (a dynamic characterized by Amy Kaplan's term, “manifest domesticity,” and by Lori Merish's, “sentimental materialism”). Listening acts in a no less dialogic and dilating a way. As Lacey argues, “listening in” and “listening out” produce the public sphere, “listening out” implying a shared public sphere of collective discourse, “listening in” invoking interiority, introspection, and domesticity—or, potentially, appropriation, intrusion, and surreptitious invigilation. So it was with nineteenth-century music, Cavicchi argues: a medium of moral suasion and sentimental feeling, in constant economic circulation. Recounting how much of the angst about urban noise was blamed on immigrants, free blacks, and the working classes, and thus ripe for middle-class sentimental moral reforms (noise legislation, the Anti-Bell-Ringing Society), Cavicchi unearths an 1838 piece of doggerel from the Boston Post: "The poor can share / A crack'd fiddle in the air, / Which offends all sound morality" (53). The interconnection of sound and morality was by no means invented in the 19th century—Richard Cullen Rath's How Early America Sounded  offers a no less richly textured study of acoustics in colonial American churches. But industry changed everything: technologically, civically, spatially, and economically. Cavicchi explores the complexities of (among other things) print culture and material culture, e.g. the production and consumption of sheet music, enjoined in the effort to construct a “sound” bourgeois morality: his archival work on copies of annotated sheet music show a collective effort to generate a musically “genteel sensibility” (90-91). Cavicchi's anecdotes are rich in local detail and global implications. His most memorable concerns the Swedish soprano Jenny Lind and the editor and middling comic singer and songwriter Ossian Dodge, at an 1850 auction designed by one P.T. Barnum (Lind's foremost American promoter). The auction itself was a carnivalesque social event, and Dodge was on the prowl for gossip. Swept up by the atmosphere, Dodge's winning $625 bid for a ticket to Lind's upcoming concert quickly went viral; lithographed images of Barnum, Lind, and Dodge began to circulate widely—even as covers for his own sheet music—and Dodge, buttressed by his new celebrity, sold out multiple concert performances. To understand what manner of celebrity this was, one needs a fleshed-out emic ethnography of how industrialization, new kinds of markets, and new modes of transportation and infrastructure energized the cultural practices of listening. Changing audience attitudes about the nature of concerts fed into new modes of concert promotion; expressions of class consciousness about audience behavior fed into expansions of acoustic space in concert halls and churches. “Audiencing” exerted an active, complex pressure on the economic and aesthetic landscape in the service of constructing a white middle-class culture; free blacks, though of course proscribed from entry to much of this musical culture, sought to participate actively in it, to use music as a “technology of the self” (Cavicchi's Foucaultism) (79). In all of these ways, nineteenth-century audiencing reads as a form of cultural labor. Intensifying competition among concert promoters, balanced by “the musicking of mothers and daughters” in the middle-class domestic sphere, generated a complex “commercial music culture” and a demand for musical virtuosity, both publicly and domestically (28, 35). Aesthetic expression and passion themselves grew rich and strange; the patterns of consumption—the drive to hear a new piece as often as possible—produced even a new descriptive vocabulary for the music itself and the sociability of the audience. Fresh opportunities to hear the human voice, and increasingly sophisticated venues in which to share that experience with others, “created a powerful yearning for sensation” fed by the growing sizes of orchestras, much as the American musical avant-garde in the 1920s depended on, and thus felt compelled to produce, the noise of public sensation (128). In ways familiar to modernists, then—domestic and imperial, entrepreneurial and sentimental, evangelical and intimate, futuristic and nostalgic—aural culture was helping to make America new in the early nineteenth century. And those writers invested in redefining the American voice could not do so without reconsidering the American “urban ear” (ch. 2). Cavicchi has a particularly fine ear for the poetry of Walt Whitman, whom he reads not only as a singing “bard” but as an evangelist for “immediate, transformative hearing,” stirred by the power of the human voice but always “mov[ing] hearing to the foreground of his readers' attention” (43, italics mine). Whitman is often on my brain as a pedagogue—one who often finds himself, say, teaching Forster's A Passage to India in modernism classes, studying D.W. Griffith's Intolerance in film courses, and eviscerating Dead Poets Society in intro classes; Cavicchi's study excavates in Whitman a profound aural sensitivity and a range of contextual implications for it. Might we hear Whitman, in his anaphoric ecstasies, as a kind of lyric auctioneer of the self? (Might Forster's echoes, a symptom of uncontainable colonial excess, also be a projection of the already-uncontainable excesses of industrialization?) Whitman claims, in “A Song for Occupations,” to “send no agent or medium . . . . and offer no representative of value—but offer the value itself” (l. 47); yet he finds “value” itself constantly inscribed in circulations of call-and-response, “occupations” both noisy and patterned. Pound's “Pact” with Whitman, in turn, seeks not merely kinship, but “commerce” (l. 9); for Pound, as for Whitman, listening was not only a private behavior of accumulation (accruing sounds to the self), but also a public act of listening out. Perhaps Barnum and Whitman, Jennings and Pound, aren't conventional bookends for modernism—but why not? Cavicchi's study is rich with discoveries, chief among them the insight that listening, for all of its associations with intimacy and interiority, with the “self” that Whitman intones into being, moves outward to accommodate commerce and alterity. To listen, or to “long,” is to enter into new circulating relationships that absorb and are absorbed by a subject, like Whitman's lyric speaker, who listens in order to be heard by another. For all of these figures, listening opens up those various forms of circulation central to “modernity,” a category both reifying and porous. “But What of the Ethnographic Ear? Anthropology, Sound, and the Senses,” in Hearing Cultures: Essays on Sound, Listening, and Modernity, ed. Erlmann (New York: Berg, 2004), 1-20. Jed Esty, A Shrinking Island: Modernism and National Culture in England (Princeton: Princeton University Press, 2004), 2-3. Amy Kaplan, The Anarchy of Empire in the Making of U.S. Culture (Cambridge: Harvard University Press, 2002); Lori Merish, Sentimental Materialism: Gender, Commodity Culture, and Nineteenth-Century American Literature (Durham: Duke University Press, 2000). In the context of radio, Steven Connor contends, “listening in” might evoke more surreptitious forms of listening, as if “one eavesdrops on a program that can never be entirely meant for one,” as if one appropriates the private “mind space” of another. Beckett, Modernism and the Material Imagination (Cambridge: Cambridge University Press, 2014), 66. Radio listening also involves threats of “intimacy, intrusion, seduction, violation,” especially when, as Debra Rae Cohen argues of the 1930s BBC, the summons to listen is produced by an authoritative “oracular” voice). Debra Rae Cohen, “Annexing the Oracular Voice: Form, Ideology, and the BBC,” in Broadcasting Modernism, ed. Cohen, Michael Coyle, and Jane Lewty (Gainesville: University of Florida Press, 2009) 142-57, 145. On the domesticity point, Kate Lacey draws attention to the BBC's 1930 “Go Home and Listen!” campaign, emphasizing the “privatized modern public, characteristically encountering public life within domestic space” (125, emphasis in original). Walt Whitman, Leaves of Grass: The First 1855 Edition, ed. Malcolm Cowley (New York: Penguin, 1959), 87-97. Ezra Pound, “A Pact,” rpt. in New Selected Poems and Translations, ed. Richard Sieburth (New York, New Directions, 2010), 39.